Beekeepers around the world have become frustrated with honey bee losses. Not only does it affect the pocket book but personal love for these insects. Bee Informed Partnership, among other things, performs annual loss reports. The past nine years (2008-2017) reports of 40.4% by Backyard and 28.1% loss by Commercial operations have proved challenging. It is significant to view these statistics side by side, with a 12.3% difference is loss. This is not the first time an onslaught against the honey bee has been seen. American Foul Brood and Tracheal Mite are but now fading from the memory. Devouring scientific research papers, attending presentations, and participating in bee related groups adds to the positive practices, but of greater importance is an appreciation of the stressors affecting the honey bee colony. Again, Bee Informed Partnership, separates the reasons for loss. 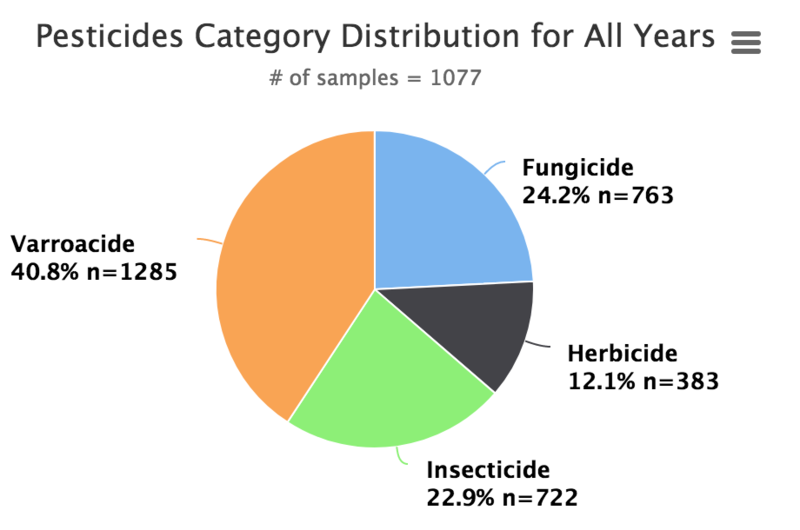 The “Don’t Know” category finds 59.5% and Colony Collapse Disorder 62.7%, both of which seem a vague identification of the underlying issues – colony stress. The Commercial Beekeeper, like others in the agricultural arena, have assimilated a management regime replicated year after year. Incorporating treatment for pests and diseases prophylactically rather than the behavior of the backyard who reacts based on evidence, often too late to be effective. The coining of the term Colony Collapse Disorder, if nothing else, has refocused significant dollars toward research of the honey bee. Although some of the stressors outlined remain vague others have come into a clear focus. Hopefully, as the beekeeper gains in knowledge and experience, their losses will diminish. Parasites (Varroa; tracheal mites) – The Varroa Destructor Mite has proven an enormous challenge. Like most pest management the beekeeper has become reliant on miticides (acaricides). These very chemicals are now being reviewed in relation to the effects on the reproduction cycles. Juliana Rangel, Texas A & M, has identified through control and miticide impregnated wax the loss of viable sperm. This must be considered in conjunction with the difference in comb, brood, food and workers produced between colonies established in miticide-free and miticide-laden environments. Those colonies treated proved significantly stronger. Viruses – Viruses identified in the honey bee were known pre-Varroa Mite, yet the mite has proven a great vector. Fig3. – The Effects of miticides on the mating health of honey bee (Apis mellifera L.) queens, Juliana Rangel, Ph.D.
Key for all beekeepers is an improved understanding of the Varroa Destructor Mite toward consistent management. Nutrition deficiencies – Much like human health, the honey bee must maintain nutritional balance. Nectar, Pollen and Water comprise the three key elements of their diet. Nectar is the primary source of minerals and carbohydrates for the bees, which provides energy, whereas pollen contains protein, fats, vitamins and minerals. A key factor in the longevity of the honey bee occurs when vitellogenin, a protein, providing longevity to the colony to sustain winter months. Thus, the health and diversity of flowering plants correlates to the health of the bees. Diseases (Nosema; bacteria; viruses) – Honey bees are impacted by the Nosema ceranae fungus, the American Foul Brood Disease, and more than 20 viruses. Weather – Elongated warm weather in the fall forces the colony to consume its vital winter honey stores as nectar is absent from their foraging areas. Winter becomes the ultimate test of the viability of the honey bee hive. Should the winter temperatures dip below freezing, the workers in their struggle to maintain homeostasis imbibe greater quantities of honey stores, thus impacting the critical period from post winter to the time before nectar begins to flow when the queen must replace the winter bee and ramp the colony strength in preparation for the flow. Spring should be a time of strengthening the population to once again prepare for the winter to come. Yet, when spring weather dips and/or rains ensue; the colony is frustrated in their efforts to gather stores in support of ramping up the workforce. Summer can also impact the hive as the nectar flow wanes the robust population may dip into their honey stores in their struggle for survival. The beekeeper must be cognizant of the impact the hive is incurring based on weather issues, just as the farmer must manage his crops in relation to the environmental challenges. Beekeeping practices – Like all things in life, time moves on, new challenges evolve for the beekeeper to modify their management practices. Beekeeping is not for the weak, often frustrating the novitiate and for some old-timers alike. With the plethora of stressors effecting the honey bee hives today, it becomes imperative to perform hive management in a ‘proactive’ stance rather than one of ‘reactive’, which often results in too little too late. Pesticides (hives; agriculture) – Miticides (acaricides) are just now being researched in relation to their effects on the honey bee. Texas A & M, amongst others, are discovering significant issues with sperm. These studies continue as the researchers meticulously conduct their studies miticide by miticide. Currently these studies are focused on the queen and drone sperm. Pesticides include insecticides, herbicides, fungicides, insect growth regulators (IGRs), and other chemicals that broadly target particular groups of organisms. Despite their enormous benefit in controlling unwanted pests, pesticides can have nontarget effects if they are applied or persist in a way that poses direct or indirect risks to beneficial organisms such as bees. Pesticides have been detected in wax and hive products. The direct effect on the honey bee colony has yet to be clearly defined. Of greater importance to the honey bee environment becomes the synergistic effect as colonies are subjected to multiple pesticides, in spite of their low doses. Genetic weakness – Researchers, like Sue Colby, are defining ‘if’ the genetic pool the United States has at its disposal, is part of the problem. The Department of Agriculture instituted a law preventing any new importation of the honey bee since 1922 (Honey Bee Act). Similar to the other stressors, limiting the injection of new stock may be a contributing factor toward honey bee colony losses. Queen issues – Viability of the hives queen, the backbone of the colony, is witnessing a declining strength. Queens just don’t seem as long-lived and fecund as they used to be, says David Tarpy, who researches beekeeping at the University of North Carolina. Sometimes worker bees even kill their own queens. This behavior, called supersedure, is part of a healthy colony’s life cycle, but beekeepers say they’re seeing it occur at an accelerated rate, which stresses hives. The modern-day beekeeper is faced with the daunting challenge to recognize the colony stressors and adapt their management styles toward survival of their charges. The strength of knowledge of the past is important but so is the emerging research efforts that are altering our appreciation of the honey bee and its interaction with the current environmental issues. 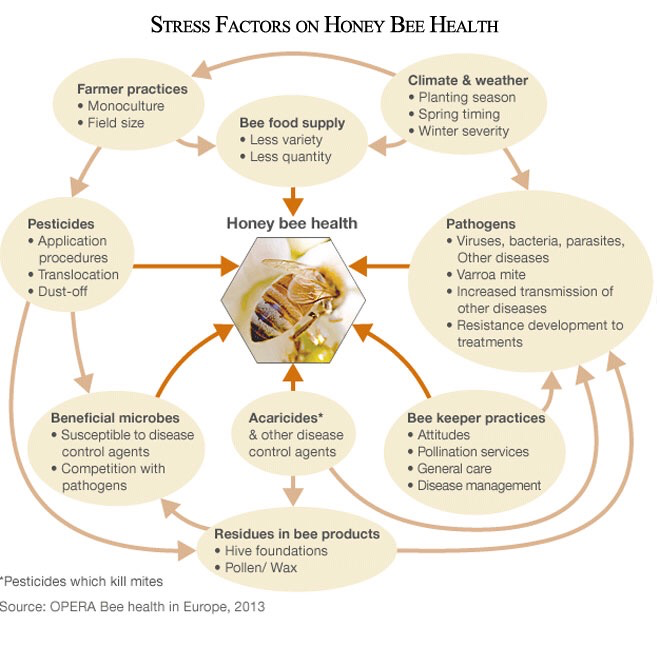 Bee Health Stressors. (n.d.). Retrieved October 18, 2017, from https://beehealth.bayer.us/about-bees/bee-health-stressors?